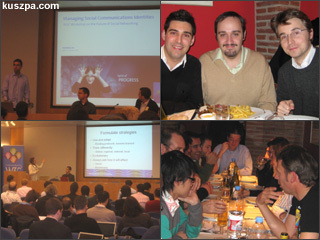 Conference, Telefonica presentation and Networking in Restaurant Egipte Ramblas. Does Social Networks need Standardization? After Registration and welcome by Christine Perey and Dominique Hazael-Massieux the workshop started with four Presentations on Appropriate Architectures for Social Networking; ‚The Social Web: Small Businesses / Big Solutions‘ Timothée Anglade (AF83), ‚Managing Social Communications Identities‘ by José Maria González (Telefónica I+D), ‚Leveraging social data with semantics“ by Fabien Gandon (INRIA) and ‚Current Issues with Social Networks representations‘ by Peter Mika (Yahoo! Research). One funny but also scary think was when Christine Perey ask the audience who it missing at this workshop: facebook, myspace, google, flickr and other big player of Social Networks were not attending – but why? The Telefonica lecture was quite interesting discussing the connection between social identities (names or alias on online social networks) and communication identities (contact number or address for communication), talking about the gateway element between Open Social Networks and Operators Network and introducing the idea of a ‚Social Broker‘ for more security of private data. Another interesting is the idea about ‚Leveraging Social data with Semantics‘ which you can read in a position paper for W3C. After the first break we had to chose between two breakout sessions; ‚Distributed Social Networking‘ and ‚Data mining‘. In the data mining sessions we discuss questions about the need of common data format for use-cases like social data integration and data-mining or to what extent should domain-specific data, such as tags and address books, be standardized. In the afternoon we had another two breakout sessions; ‚Privacy and Trust‘ and ‚Distributed Architectures and Business Models‘. I liked the discussion about the business models and the roles of mobile network operators outside their ‚walled garden‘. In between there were more lectures like ‚Enabling Trust and Privacy on the Social Web‘ by Alexandre Passant (Deri Galway), ‚Towards an OpenID-based solution to the Social Network Interoperability problem‘ by Michele Mostarda (Asemantics S.R.L. ), ‚Telecom Italia view on the future of Social networking‘ by Claudio Venezia (Telecom Italia), ‚Trends in mobile social networking for mainstream consumers and supporting technologies required‘ by Lisa McKnight (Nokia) and ‚Social networking across devices: opportunity and risk for the disabled and older community‘ by Henny Swan (Opera).